While the road to academic success has its fair share of trials and tribulations for any student, for Tinyiko, obtaining a degree was particularly challenging – she was born with tetra-amelia syndrome, a congenital disorder characterised by the absence or malformation of the limbs. “Fortunately, I survived all the hardships I faced and was motivated to work hard at my studies,” she says. Growing up came with various difficulties for the wheelchair-bound 23-year-old. She attended a private school in Tshilamba in Limpopo, which was not properly geared towards supporting people with disabilities. Yet for the new graduate, being born with a disability hasn’t been her greatest challenge – the untimely loss of her mother when Tinyiko was 16 years old was for her the biggest setback. “Severe challenges are a part of one’s life, especially when you are living with a disability,” she says. “It becomes worse when one or both parents are not there. Her mother’s sister became her primary caregiver, and Tinyiko is thankful for the love and support she received from her family. She found the strength to persevere, and passed Grade 12 with two distinctions and six B-symbols. Tinyiko was then accepted at UP where, she admits, the early days were tough. During her four years at the university, she relied on the Areyeng municipal bus service to get to campus, but there were several days when the service did not operate as a result of strikes, among other reasons. 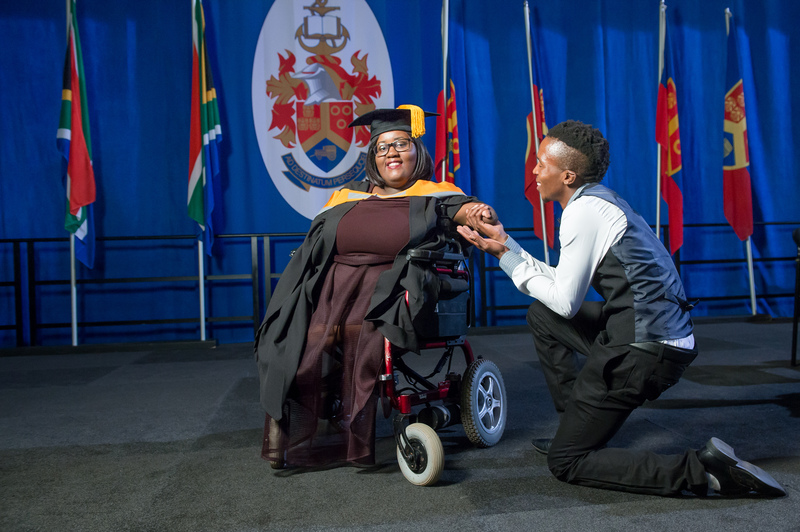 On such days Tinyiko’s sisters – Willemina, also a BSW graduate at UP, and Gathrie, who has a BCom in Accounting from the University of Venda – would push her to campus in her wheelchair to attend classes. Without her sisters, friends Portia Hlophe and Agnetia Mlambo, and her fiancée, Xolisa Makeleni – who followed Tinyiko like shadows on campus to assist her – the young woman says she simply would not have made it to graduation day. She also acknowledges the Disability Unit and the Department of Social Work and Criminology for the support these divisions gave her, and continue to give other students with disabilities to perform according to their capabilities. Despite the fact that her upper extremities are severely afflicted, Tinyiko wrote all her tests and examinations – in fact, her lecturers describe her neat, legible handwriting as being the envy of many able-bodied students. The diligence and dedication with she approached her studies resulted in Tinyiko performing consistently well over the past four years, and in her second year, she received the award for Best Social Work student. As for the future, she would like to become an entrepreneur with the aim of making a real difference in the lives of marginalised communities and people with disabilities. To this end, Tinyiko intends to pursue a master’s programme in Social Development and Policy in the Department of Social Work and Criminology.